I read this somewhere in the 1990s as a standard-sized paperback, probably about 200ish pages. The protagonist is a man on Earth who I remember was acting as a Batman-style vigilante, I think maybe funded by being a trust fund baby. I do remember that he was nursing significant bruises at the beginning of the book, I think with the implication that his romantic notions of crime-fighting were out of touch with the real world. 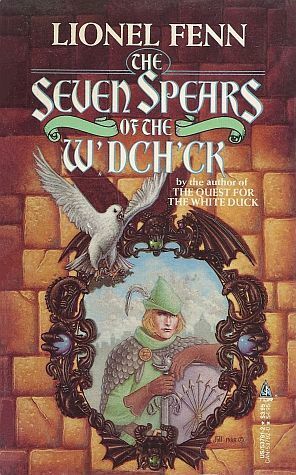 He gets sent to a fantasy world, I think summoned by a set of priests who are devotees of the Woodchuck, except the name has been put through the Punctuation Shaker with a bunch of vowels replaced by apostrophes. I think he's given the cloak, which can become rigid, which comes into play in the course of the novel, I think once as protection where he kind of turtles under it and once where he turns it into a boat. Unfortunately, I don't really remember what happens in the plot after that. The title had the Woodchuck in it, and I want to say that "seven" came up in it. And... I just managed to find it, so I'll post it as a self-answer. In an age where real men eat quiche, Jerico Dove stands out like the proverbial odd duck. A man of wealth and experience who longs to fight the good fight and preserve justice, truth and the American lifestyle, Jerico finds himself unwanted, ridiculed, and abused in a society that finds such virtues laughable. Jerico resolves to end his crime-fighting days--that is, until he is kidnapped on top of an elephant and spirited off into the wilds of New Jersey, of all places. Jerico's captors present him with an out-of-this-world oppurtunity... literally. Dove is given his heart's desire: to go to the limits of his powers to help save a wondrous land from certain destruction--to be the man to save the day. And all he's got to do is recover the Seven Holy Spears of the W'dch'ck, defeat an infinite array of the most malicious evils the world has ever seen, and stop the malevolent madman who's behind it all. A caped crusader's work is never done. After I remembered the "seven" part of the title, and thinking it was maybe "seven spears", I did an ISFDB search, and found it. My library doesn't carry it, but I've requested it from the Archive.org library.